CanariCam is a mid-infrared (7.5 - 25 micron) imager with spectroscopic, coronagraphic, and polarimetric capabilities, which will be mounted at one of the Nasmyth foci of the GTC. It is designed to work as a diffraction-limited imager at 8 microns. The instrument uses a Raytheon 320x240 Si:As detector which covers a field of view of ~26"x19" on the sky. Most mechanism motors and optics are inside a cryostat which is cooled down to 28K using a He cryo-cooler system. Temperature control of the detector ensures that its optimum operating temperature (~9K) is stable in the mK range. CanariCam is designed to reach the diffraction limit of the telescope at mid-IR wavelengths. However, to do this routinely the telescope will have to be equipped with a fast-guiding mode that will allow for fast tip-tilt correction. Currently fast guiding is not yet available and hence initially the very best image quality cannot be guaranteed. The following table summarizes all observing modes available for CanariCam. Only those modes that have been fully commissioned and offered in the current semester appear in the table. The following table summarizes some basic parameters of the instrument. Field of View 25.6" X 19.2"
CanariCam’s optical train consists of three powered mirrors and six flat mirrors, two of which are inserted into the beam when needed. The relationship of the powered mirrors and the various image planes is indicated in the figure below. 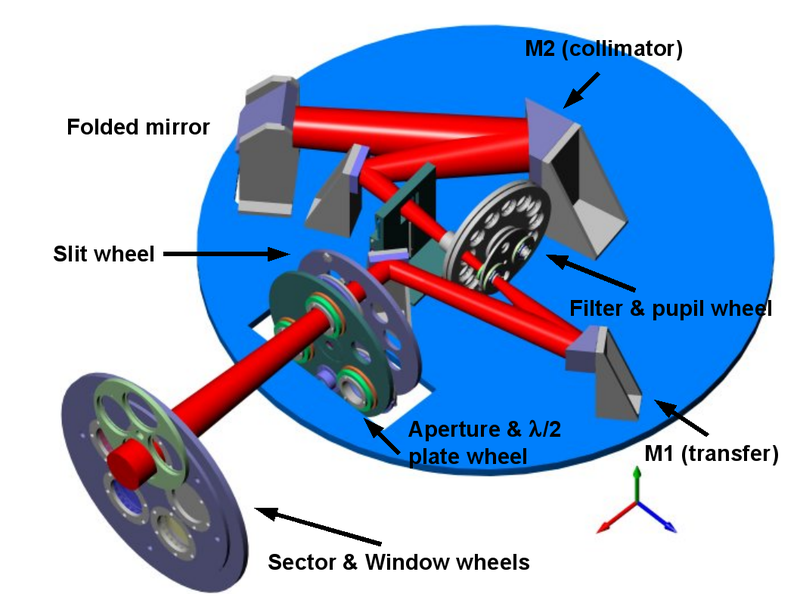 The first powered mirror (transfer mirror M1) forms an image of the telescope entrance pupil and reimages the telescope focal plane. The second powered mirror (collimator M2) collimates the beam and forms a second image of the pupil. The third powered mirror (camera M3) images the telescope focal plane onto the detector. A flat mirror or one of several diffraction gratings is inserted near the final pupil image (p2) for imaging or spectroscopy. To improve operational efficiency, an additional flat mirror can be inserted just up-stream from the diffraction grating during spectroscopic observations to permit monitoring of the source location on the slit without the need of moving the grating turret from the grating to the mirror position. These and the remaining flat mirrors have been added to the system to fold the beam and permit packaging the system into a fairly compact layout. Aperture stops and coronagraphic masks are located at the telescope focal plane, rotating and fixed Lyot (pupil) stops and a selection of up to 26 discrete filters on a double filter wheel are located at or very near the first pupil image (p1), and a selection of spectroscopic slits are located at the first re-image of the telescope focal plane (i1). 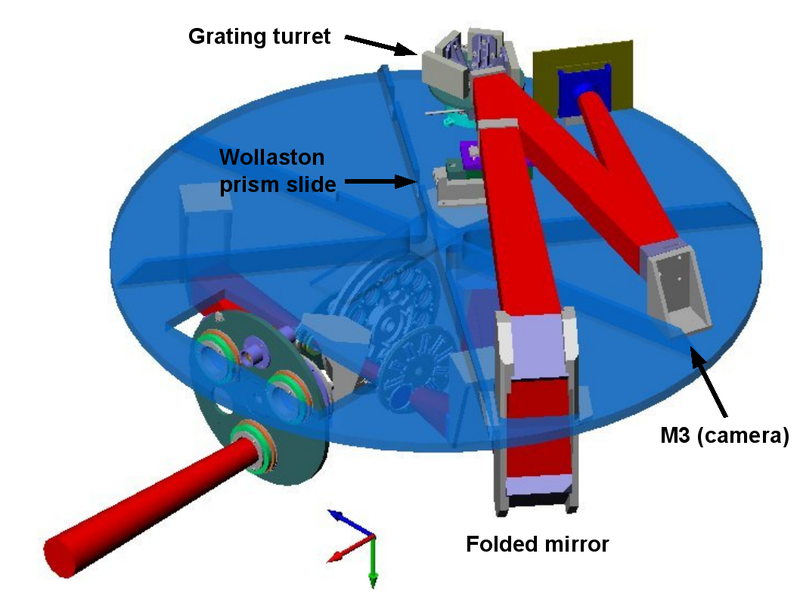 For polarimetry, rotatable half-wave plates can be inserted into the beam just up-stream from the telescope focal plane, and a Wollaston prism can be inserted into the collimated beam near p2. Finally, a lens doublet can be inserted between the first pupil and the first re-image of the telescope focal plane in order to view the pupil, and a lens doublet can be inserted near the telescope focal plane in order to view the outside (external) surface of the entrance window. Top: Unfolded optical layout of CanariCam indicating relationship of powered components to image and pupil planes. Bottom: 3D-view of the optical layout. The following table summarizes some basic parameters of the detector. A plot of the quantum efficiency and an image of the detector can be found below. At the time of factory acceptance, only two dead pixels were identified in the detector, with coordinates (207,82) and (208,82). Between July 22nd and August, 2nd, 2013, we detected several dirt particles on the detector, which are shown in the next figure (right panel) in comparison with the previous situation (left panel). Detector dirt as seen on July and August, 2013. Note some new dirt particles that appeared on August, 2013, were located in the areas bewteen pixels (20,50) and (40,100), (80,180) and (90,230), and at approximately pixel (295,55). Users were advised at the time of appearance of these dirt particles not to place their targets near the lower-left corner of the detector. A cleaning operation was performed in October 2013 by which the largest dirt particles were removed. The result is shown in the next figure. CanariCam detector cosmetics from October 25th 2013. Therefore, the large dirt particles will appear only in data taken from August, 2nd to October, 25th 2013. To date, the Raytheon device remains the largest format mid-IR array in astronomical use. However, this device displays several unwanted effects when exposed to a very bright source. Below we discuss these effects as well as readout methods used to reduce them. Each contiguous group of 20 vertical columns is read out through one of the 16 output channels (i.e., columns 1-20 are readout through channel 1, columns 21-40 are readout through channel 2, etc.). In addition, the first pixel read out in each channel is the lower-left one and the last is the upper right one. Single-Point Sampling (S1) Advantages: Minimum frame time - 5 ms Disadvantages: Vertical "level-drop" patterns appear for brigth sources. Horizontal "level-drop" patterns appear for bright sources. Correlated Quadruple Sampling (S1R3) Advantages: Vertical level-drop patterns are removed. Disadvantages: Minimum frame time is increased to 20 ms -> Broad-band imaging may be difficult or impossible with this mode. Increased readout noise -> May reduce sensitivity in high-resolution spectroscopy. NOTE: Artifacts are only < 1% the source peak and only appear in very bright objects. Double correlated sampling with column clump read (S1R1_CR) Advantages: It eliminates the vertical "level drop" pattern. Minimum frametime is 9 ms, which is acceptable for imaging in high background conditions. Disadvantages: The horizontal "level-drop" patterns still appear for bright sources. Following extensive testing, the most appropriate readout mode that best covers the requirements for the different observing modes is S1R3. This readout mode has been established as the default mode for CanariCam. In the following figure we show an example of the cross talk features seen in the CanariCam detector in the S1R3 readout mode. The image was taken in the lab with a 3-spot mask in the ArIII filter. The depth of the cross-talk (dark horizontal strips crossing the 2 brightest spots) has a dependency on frame time, but does not depend on the separation from the source. In any case these features are always < 1% of the source peak. Cross talk features seen in the CanariCam detector in the S1R3 readout mode. Imaging with CanariCam is diffraction-limited at 8 micron over the full 26"x19" field of view. The detector plate scale (0.08 arcsec/pixel) ensures the diffraction-limited Point Spread Function is Nyquist sampled at 8 micron. During factory acceptance testing, image distortion accross the FOV has been proved to be less than 2 pixels center-to-corner. CanariCam mounts 6 medium-band Silicate filters and 12 narrow, medium and broad band filters that were specified by the VISIR filter consortium. Filters were provided by the University of Reading. A very slight, but noticeable, difference among some of the filters in the optical beam direction after passage through the filters. This results in a slight shift in the location of an astronomical image as one changes filters. (*) In imaging mode, these filters should be used only when observations are in low background conditions (PWV < 3mm for N and Qw, and PWV < 5mm for SiC), otherwise images will saturate with the minimum frame time available in the standard CanariCam readout mode. The N and SiC filters can be used in polarimetry mode even in relatively high background conditions. The following table shows the imaging sensitivity in all CanariCam filters for average background conditions at the ORM (PWV~7mm). The sensitivities are shown in mJy and correspond to a 5-σ detection in 30 minutes on-source. Data were obtained on January 29th, 2013 using the mid-IR standard HD3712. The sensitivity is calculated on the same set of data reduced using two different methods. In the first case (2nd and 3rd columns in the table), a simple stacking of the different savesets forming the total image was used. In the second case (4th and 5th columns) the savesets were aligned before stacking (shift-and-add technique). The shift-and-add technique gives better results in terms of FWHM of the PSF as well as in terms of sensitivity, as expected, because the final PSF is less spread out. 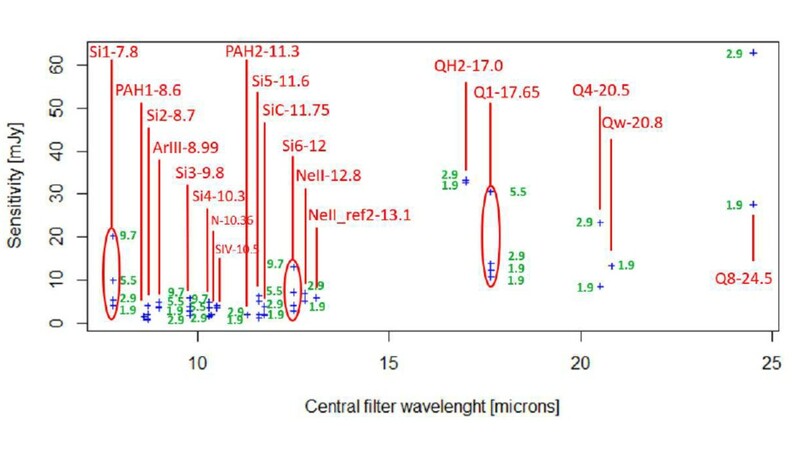 As a comparison, the following table shows the sensitivity in mJy (5-σ detection in 30 minutes on-source) that can be achieved in very high background conditions, with PWV~20mm and a high concentration of dust particles (42 μg/m3) in the atmosphere due to an episode of calima (Saharian dust). Data were obtained on August 18th, 2013 using the mid-IR standard HD3712. Images were reduced using the shift and add medthod which was shown in the previous table to give the best sensitivity results. From this plot we can identify the filters which are severely impacted by the increase of PWV, that have been marked with and ellipse. We can also see the severe effect of even low amount of PWV can have in the instrument sensitivity when operating at longer wavelenghts in the Q band: an increase of 1 mm in PWV represents a degradation in the sensitivity by a factor of more than 2 in the Q8 filter and close to 3 in the Q4 filters. It is important to notice that when the PWV is increased from ~7mm to ~20mm (plus calima) the sensitivity in the 10-micron filters is degraded by a factor of about 4 while the sensitivity in the Q1-17.65 filter, which is in the 20-micron atmospheric window is degraded by a factor of about 55. Note also that the FWHM of the PSF is slightly worse in the data taken on August 18th than on January 29th, which also contributes to the sensitivity degradation. These data reinforces the idea that the effect of the PWV in the sensitivity is reatively small in 10-micron observations while it is critical in 20-micron observations. The image quality of diffraction-limited data is a combination of the FWHM and ellipticity of the PSF, and the Strehl ratio. The Strehl ratio is defined as the ratio of the measured PSF peak and the peak of the theoretical diffraction-limited PSF, which gives us an idea of how concentrated the energy is within the PSF. The following table shows the FWHM and ellipticity of the PSF as well as the Strehl ratio measured in all filters using images of the standard star HD3712 taken on January 29th, 2013. A chop/nod throw of 8" along the detector diagonal was used during the observations. The FWHM, ellipticity, flux and peak of the PSF was measured using IMEXAM in IRAF. In oder to calculate the Strehl, a theoretical normalized (i.e. total flux equals 1) monochromatic PSF of the GTC was created for the specific wavelength of each filter using a theoretical pupil image of the telescope (without including the gaps between segments and the M2 support spider). The theoretical PSF was sampled to the pixel scale of CanariCam (0.08"/pixel). Then the PSF total flux was measured in all filters in the images of the star HD3712. The images were normalized to the measured total flux and the PSF peak was measured in each of the normalized images. The Strehl ratio was obtained as the peak of normalized PSF measured in the real data divided by the peak of the normalized PSF in the theoretical PSF images. The last column in the table shows the theoretical FWHM of the diffraction-limited PSF as λ/D, where D is the diameter of the pupil, which is 9.4 meters because an inscribed circular pupil stop is used in CanariCam observations to minimize the background emission. The table shows the results from the same set of data reduced using two different methods. In the first case (2nd to 4th columns), a simple stacking of the different savesets forming the total image was used. In the second case (5th to 8th columns) the savesets were aligned before stacking (shift-and-add technique). An improvement in the image quality can be seen when the shift-and-add reduction method is used. The Strehl ratios improve as we move to longer wavelengths. Note also that the measured FWHM of the PSF approaches the diffraction-limited PSF as the wavelength increases, as expected, because at longer wavelength the impact of the seeing and other PSF smearing contributions (e.g. wind shake or guiding errors) is smaller. 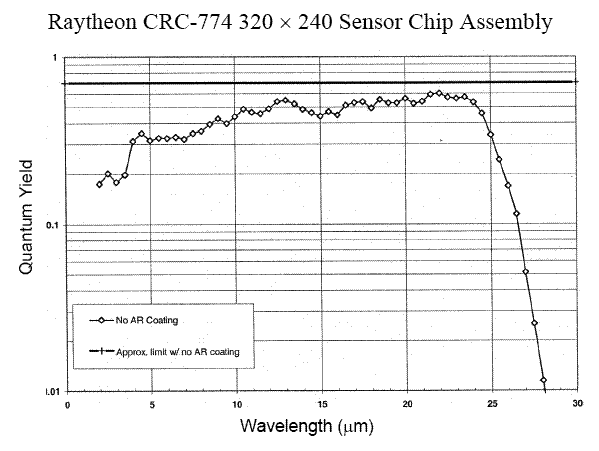 In the currrrent semester, there are two low resolution gratings provided, one spanning 7.4-13.5 µm and the other spanning 15.7-25.3 µm in a single setting. The gratings are optimized for use in first order, although use in other orders is permitted. When using either of the low-resolution gratings, a single setting places the entire operational wavelength range for that grating on the detector array. The following table shows the nominal characteristics of each grating. Values shown in the table are predicted, not measured. The following figure shows the 5-σ sensitivity for an integration of 30 minutes on-source as a function of wavelength in the 10-μm low-resolution spectroscopy mode using four different standard stars observed in three different nights. 5-σ sensitivity in 30 minutes on-source in 10-μm low-resolution spectroscopy mode. The figure shows that the sensitivity in 10-μm low-resolution spectroscopy mode ranges from ~50 mJy to ~150 mJy depending on the night and the star used. In one of the nights the PWV was ~4 mm but in the other two the nights the PWV was over 8 mm. The airmass was ranging between 1.0 and 1.4 depending on star and night and the slit correction factor was ranging from 1.1 to 1.9. Two different slits were used, 0.52” and 0.36”. It is important to bear in mind that these sensitivity values were obtained using a trace of constant aperture across the whole wavelength range. This means that at bluer wavelengths, where the PSF is narrower, there is a higher contribution from the background within the aperture than at redder wavelengths. The following figure shows the 5-σ sensitivity for an integration of 30 minutes on-source as a function of wavelength using three different standard stars observed in two different nights. 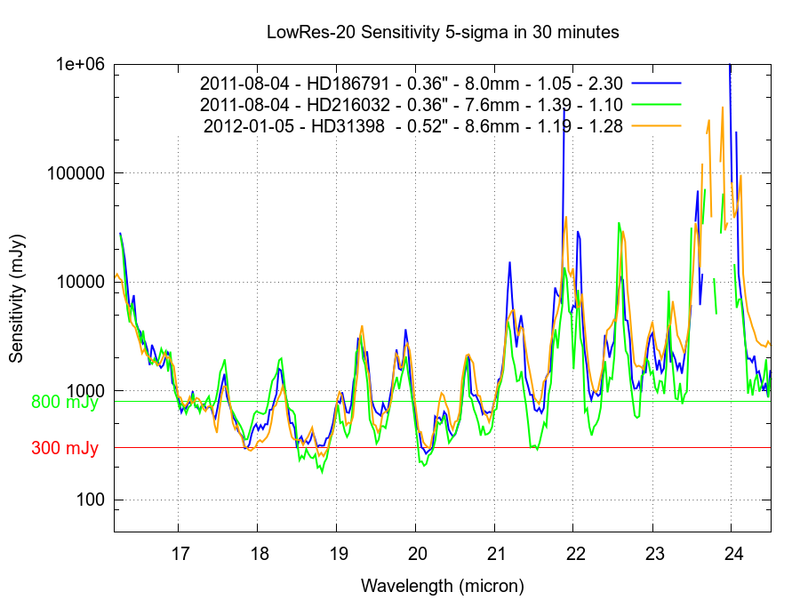 5-σ sensitivity in 30 minutes on-source in 20-μm low-resolution spectroscopy mode. The figure shows that the sensitivity in 20-μm low-resolution spectroscopy mode ranges from ~300 mJy to ~800 mJy. In this case, there is a stronger dependency of the sensitivity with wavelength than in the 10-μm window, due to the presence of strong water lines in the 20-μm atmospheric window. Wavelength calibration is performed in CanariCam spectroscopic data using the sky lines availabe in all scientific and standard star spectral data. This wavelength calibration calibration method is the standard that we recommended. An additional form of wavelength calibration (only for 10 μm spectroscopy) is to introduce in the optical path a Polystyrene plate that CanariCam has in the sector wheel. Wavelengh calibration using the Polystyrene plate is rarely necessary and therefore it will only be taken if requested and justified. 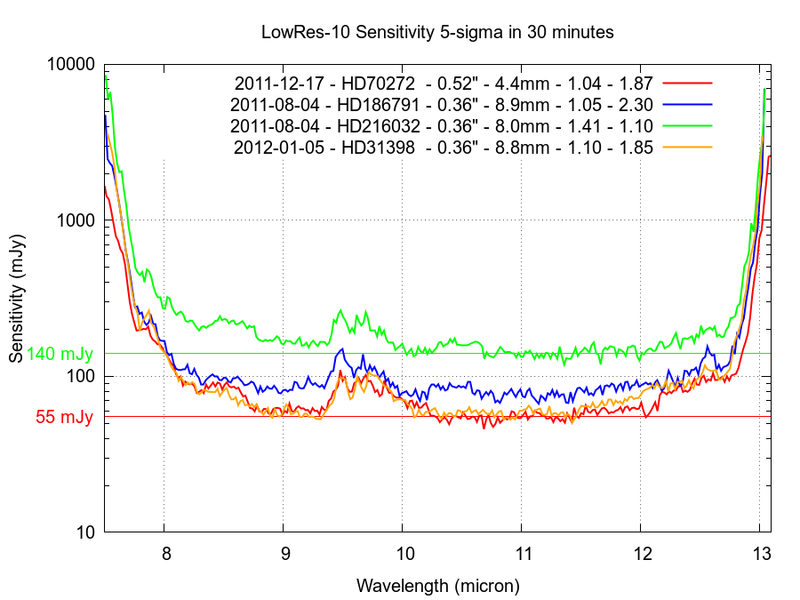 The following table shows the sky emission lines at 10 and 20 microns that can be used for wavelength calibration. Sky emission lines for wavelength calibration at 10 and 20 microns. The line maps for the LowRes-10 and LowRes-20 gratings, are shown in the following plots. 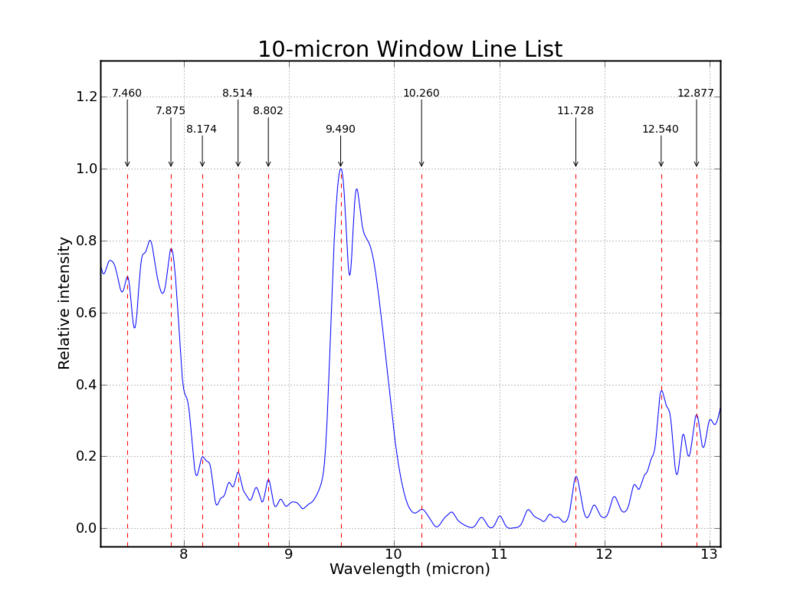 Sky emission lines in the 10-micron atmospheric window. Sky emission lines in the 20-micron atmospheric window. The set of Polystyrene lines for 10-micron spectroscopy is listed in the following table. Polystyrene emission lines for optional wavelength calibration. This table can be downloaded in Ascii format from polye.dat. 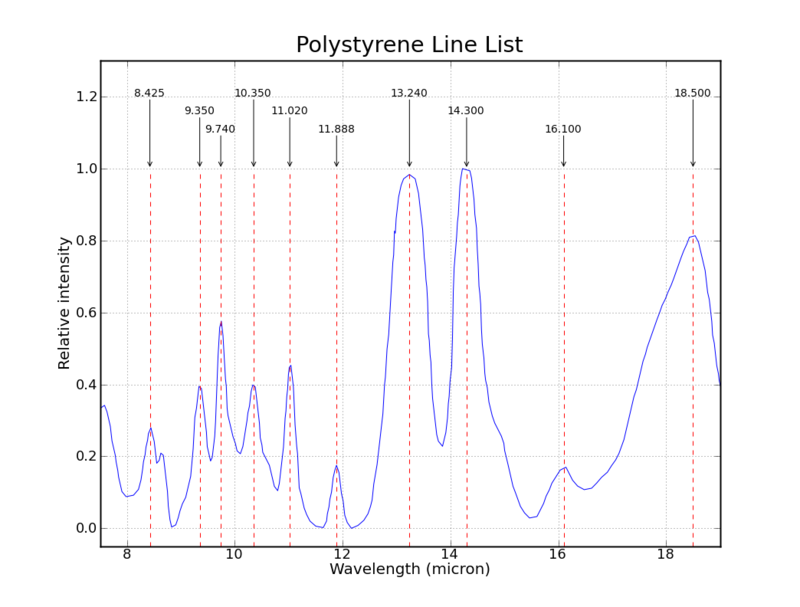 The following figure shows line map for identifying the Polystyrene emission lines. A linear transformation between the pixel and the wavelength scale is recommended when performing the wavelength calibration of the observed spectra. CanariCam permits dual-beam polarimetry in the 10 micron window by insertion in the optical path of a half-wave plate, a field mask and a Wollaston prism. During an observation, the half-wave plate is rotated to four position angles (0°,45°, 22.5° and 67.5°), which results in the rotation (relative to the Wollaston prism and detector) of the plane of polarization. The Wollaston prism separates the two planes of polarization (the ordinary and extraordinary rays), which are subsequently imaged on the detector. The focal-plane mask prevents overlap of the orthogonally polarized images for extended sources. The field of view is reduced by a factor of ~2 through the inclusion of a polarimetry mask in the aperture wheel. This is required so that the orthogonally polarised light (o and e rays) from the source (sky) do not overlap onto each other. As there is some chromatic birefringence, the 'slots' of the polarimetry mask in CanariCam are slightly oversized. The useful exposed field of view is 320x25 pixels per slot per polarised beam, corresponding to 25.6"x2". A total of >2.5 slots can be cleanly used, hence providing a field of view of 25.6"x5" in imaging polarimetry mode. Skech of how dual-beam imaging polarimetry works. The light any object of the sky, which can or cannot be polarized, passes through the HWP. The HWP polarizes the beam linearly in one direction. Then the polarization mask selects only half of the FOV. Finally the beam is split in ordinary and extraordinary rays (O and E rays). Image polarimetry of a black body (laboratory ambient temperature) taken with CanariCam. The light has passed through the HWP, polarimetric mask and Wollaston prism. Narrow and very dark stips are due to the mask slots being oversized. During an observation in polarimetry mode, the HWP rotates automatically between the four position angles of 0º, 45º, 22.5º and 67.5º. The rotation of the HWP is synchronised with the chopping and nodding so that the final raw image cube is composed of several extensions, each one of them corresponding to a wave-plate angle (see next figure). Due to the birefringence in the Wollaston prism, for each HWP image, we can see two images of the astronomical source, corresponding to the ordinary and extraordinary rays, respectively. The Stokes parameters for the astronomical source can be recovered from a combination of the ordinary and extraordinary images for each value of the HWP. Raw polarization image extensions corresponding to the first nod position in an observation of an unpolarized standard star for which a 100% linear polarization has been imposed by introducing a wire-grid in the optical path. The HWP angle rotates from one extension to the next, which causes the brightness of the ordinary and extraordinary images of the star (upper and lower images of the star in each image, respectively) to change from one HWP angle to the next, since the source is polarized. The same observation of an unpolarized source would show the same intensity in both rays. A chop/nod throw of 10" along the polarization mask slots was used. Therefore, both, the negative and positive images of the star can be seen because the on-source and off-source chopping images were subtracted. The first point that we need to bear in mind when preparing an observation in polarimetry mode with CanariCam is what is the SNR required to reach a given polarization accuracy. The polarization accuracy that we may need to reach will depend on the expected polarization in the target of interest. If the science target has an expected degree of polarization of 3%, the observer may want to be able to reach a polarization accuracy of 1% in order to ensure a 3-sigma detection of the expected polarization. Therefore, in this case, a SNR of sqrt(2)/0.01 = 141 would be needed for the observation. These calculations are included as part of the CanariCam Exposure Time Calculator. In the previous table the filter name also shows its central wavelength in micron. The previous data show that wave plate efficiency peaks at about 10.3 micron. The instrumental polarization of CanariCam and GTC was first measured during the commissioning run held between June 1st and 6th, 2012. Since that commissioning period, we have measured it several other times to keep monitoring its value. Measurements have been done in all Silicate filters and the N-10.36 broad filter. The instrumental polarization can be obtained by observing a star which is not known to have intrinsic polarization using the CanariCam polarimetry mode. The following table shows the instrumental polarization corresponding to two different measurements made in two different nights. Each night a different standard from the Cohen list was used, both of which are not known to have polarization, so that they can serve as non-polarized stars. The orientation of the detector on the sky, or instrument position angle (IPA), in each of the nights was different in order to find any dependency of the instrumental polarization angle (see below) with the detector orientation. The table shows, amongst other parameters, the degree and angle of instrumental polarization with their corresponding errors, the SNR of the data and the expected polarization accuracy from the formula sqrt(2)/SNR. Instrumental polarization measured in two different nights. The columns represent the (1) filter name, (2) FWHM of the PSF in the image, (3) percentage of polarization (P), (4) error in P, (5) polarization angle (PA), (6) error in the PA, (7) SNR of the data, (8) expected polarization accuracy from the measured SNR. The data were reduced using an automated set of Pyraf scripts specifically created to measure the polarization of point sources. The Stokes parameters were determined using the formulae described in the book Astronomical Polarimetry by Tinbergen (2005), known as the ratio prescription method. The results of these scripts were cross-checked with POLPACK, which was producing the same results within the errors. The errors shown in the table are the result of propagating the photometric errors in the formulae. The following figure shows the whole set of instrumental polarization measurements taken in the period between June 2012 and September 2013. Degree of instrumental polarization for different filters taken during the period between June 2012 and September 2013. The size of the symbols is proportional to the degree of instrumental polarization. 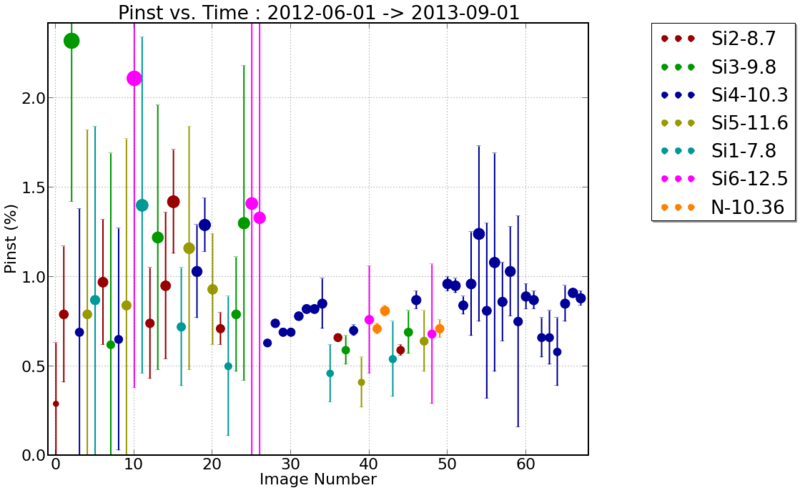 Data with the larger error bars correspond to June 2012 because the SNR of the images was very low. The previous figure indicates no clear trend between the values obtained with different filters. The dispersion is high amongst the values with higher error bars, corresponding to lower SNR in the images. However, most of the values with small error bars are consistent with a degree of instrumental polarization of ~ 0.6% - 0.7% across the 10-micron atmospheric window. The previous tabular data indicate that the instrumental polarization angle (PA) varies considerably from one measurement to the other. The reason of such a variation is that CanariCam is located in the Nasmyth-A focus of GTC. There is a reflection at the GTC flat tertirary mirror (M3) with a 45 degree angle of incidence, which is expected to produce most of the instrumental polarization. The orientation of this reflection in the detector reference frame changes when the instrument position angle is changed and also varies as the elevation of the star evolves with time. We have used most of the data shown in the previous plot (removing the ones that did not have a high enough SNR) from non-polarized stars to try to find an empirical relationship between the instrumental polarization PA and the rest of angles that vary during an observation. 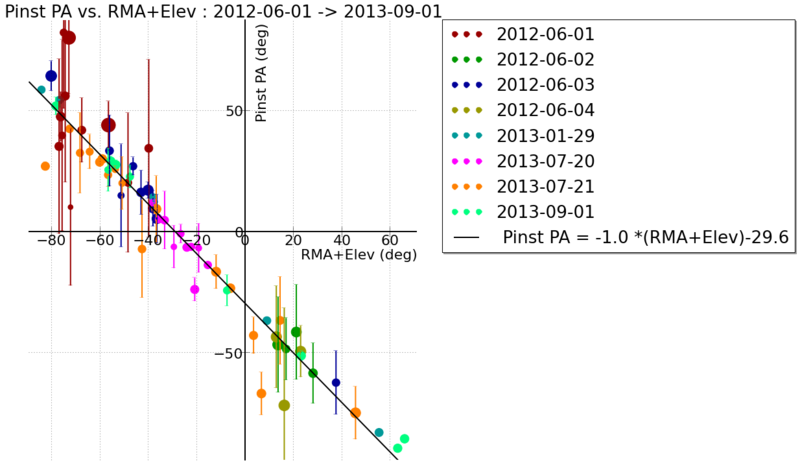 The following plot shows that there is a clear correlation between the instrumental polarization angle and the quantity RMA+Elev, where the RMA is the Nasmyth rotator mechanical angle and Elev is the average telescope elevation during the observation. It turns out that the angle RMA+Elev is the telescope pupil angle plus a constant that depends on the instrument position angle (IPA) on the sky. Dependency of the instrumental polarization angle with the RMA+Elev angle. The size of the symbols is proportional to de degree of polarization. The colors represent different dates. Observations with all Silicate filters and the N-10.36 filter are included in this plot. The values of RMA+Elev have been folded to be in the interval [-90º,90º]. We are regularly monitoring the instrumental polarization to determine if there are variations related to dust accumulation and/or aluminium coating degradation in the M3 mirror, but we have not reached any solid conclusion yet. 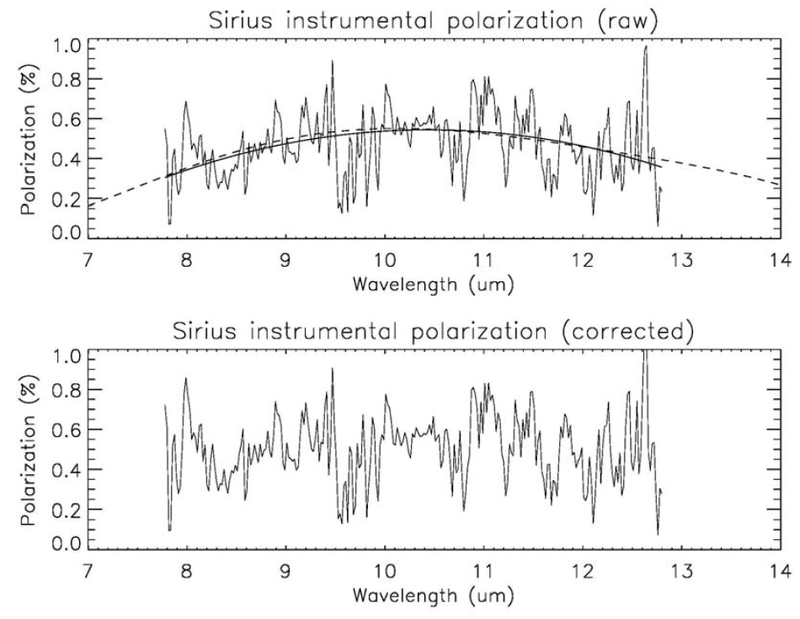 Even though the angle of instrumental polarization for a given observation could be extracted from the observational parameters (RMA, ZD and IPA), we advise observers to always plan for a non-polarized standard star observation for every polarimetric science observation (see Section Calibrations below) because of possible changes in the instrumental polarization with time (e.g. due to variations in M3 reflectivity). This recommendation is particularly strong when the expected degree of polarization in the science target is less than 2%. The calibrations required in polarimetry will depend on the scientific goals for each specific program. All standards should be observed as close in time and space as possible to the science target. PSF standards may be required when the scientific objective requires a good PSF characterisation, for instance, when some type of deconvolution will be performed during data reduction to search for low-lying diffuse structure around a bright PSF core. It is important to use the same chopping and nodding configuration for the standard as for the science target, to make sure that the instrumental PSF is well characterised. It is recommendable to observe the PSF standards in polarimetry mode to have exactly the same optical elements in the optical path for the standard as for the science target. PSF standards can be selected with the mid-IR standard finder. Flux standards will be required when the science target needs to be calibrated in flux. In this case, it is not necessary that the standard is observed using the same chopping configuration as the science target. Flux standards should be observed in polarimetry mode to ensure the appropriate conversion between ADUs and physical flux units. Flux standards can be selected with the mid-IR standard finder. Polarized standards, i.e. astronomical sources with a well known degree of polarization and polarization angle, are required to calibrate the degree and angle of polarization of the scientific target. It is recommendable to observe these standards using the same configuration as the in the science target. There are not many good polarized standard stars available for the mid-IR, but here we provide two external web resources that can be useful to find them. The following link from the UKIRT web page shows a list of polarized standards, although polarization values re given at wavelengths shorter than the mid-IR. Additionally, the paper by Smith et al (2000) contains a list polarized sources in the mid-IR with known degrees of polarization and polarization angles. Even though the degree of instrumental polarization of CanariCam+GTC and its dependency with the pupil angle is well known and seems to be stable in time, it is strongly recommended to observe a non-polarized standard for each science observation in order to have a measurement of the instrumental polarization as close as possible in time to the science observation. Many of the Cohen standards from the mid-IR standard finder can be used as non-polarized standards, as soon as they are not known to have dust shells surounding them. It is important to bear in mind that all calibrations required for a science program should be taken into account during the time estimates when preparing the Phase-1 of your proposal. Some guidelines on how to estimate the overheads associated to standard stars can be found in the section about Overheads. Also, when preparing the Phase-2 of your proposal, all standard stars required for each science target must be defined as separate observing blocks. To extract the Stokes parameters from the polarization data it is necessary to relate images taken at different half-wave-plate orientations during the whole observing sequence. In this sense, polarimetric observations can be considered as relative photometry observations. Therefore, it is important that the conditions are as stable as possible during the whole observing sequence. It is advisable to request nights with photometric or clear conditions. Clouds with variable thickness and temporal changes in other atmospheric parameters such as PWV and seeing in scales of minutes may lead to wrong polarization results. In general, one should not apply for CanariCam polarimetry in conditions of type "Any" or "Spec". Data reduction in polarimetry can be performed using the Starlink POLPACK software. CanariCam optical design allows having the Wollaston prism and a diffraction grating simultaneously in the optical path. The birefrigency direction is orthogonal to the spectral direction and therefore the instrument is capable of doing dual-beam spectropolarimetry in the 10 micron window. The operation of this mode implies the insertion in the optical path of a slit, a half-wave plate and a field mask in addition to the Wollaston prism and the diffraction grating. During a spectropolarimetric observation, the half-wave plate is rotated to four position angles (0°,45°, 22.5° and 67.5°), which results in the rotation (relative to the Wollaston prism and detector) of the plane of polarization. The Wollaston prism separates the two planes of polarization (the ordinary and extraordinary rays), which are subsequently imaged on the detector as separate spectra because the diffraction grating is also in the optical path. The focal-plane polarization mask prevents overlapping of the orthogonally polarized spectra for extended sources and the slit is required to constrain spatially the spectral direction, as in any standard spectroscopic observation. In CanariCam the spatial direction is along the detector Y axis and the spectral direction is along the detector X axis. Similarly to the imaging polarimetry observations, the field of view in spectropolarimetry is reduced by a factor of ~2 through the inclusion of a polarimetry mask in the aperture wheel. Therefore, the available slit length in spectropolarimetry will be only 5" instead of the 19" slit length available in spectroscopy. Typical observing sequence in spectropolarimetry. (Top-left) Acquistion image of the BN-KL star forming region in Orion in the Si2-8.7 filter. (Top-right) Mask image of the same FOV with the same filter. The polarization mask dark slots can be clearly distinguished from its open slots. Still, since the BN object is several hundreds of Jy bright in the mid-IR, some of its light is bleeding out to the dark slots. (Botton-left) Slit and mask image. In this case, the 0.52" slit was inserted. (Bottom-right). 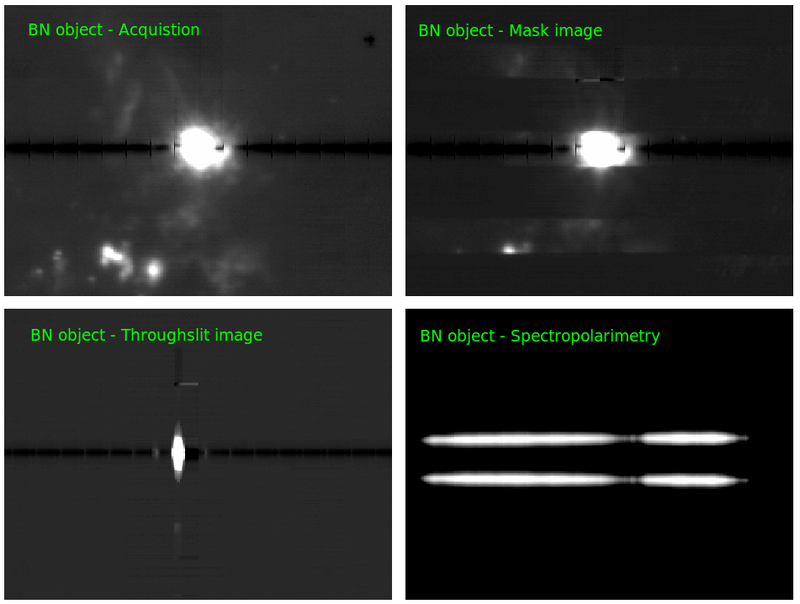 Accumulated ordinary and extraordinary spectra of the BN object for all four HWP angles (0°,45°, 22.5° and 67.5°), once the 10-micron low resolution grating has been inserted in the optical path. The information shown in the following sections is the result of the spectropolarimetry commissioning data analysis made by Chris Wright. Also very valuable in helping the GTC with the spectropolarimetry commissioning mode have been the contributions of Enrique López, Chris Packham, Dan Li, Charlie Telesco, Pat Roche and other members of the CanariCam Science Team who have offered their help during the whole process. The data used to derive the information shown here were taken on different commissioning nights between June 2012 and July 2013. The spectropolarimetry mode in the CanariCam Exposure Time Calculator can be used to estimate the polarization accuracy to be reached as a function of wavelength for a given target. The polarization measurement efficiency is given by the actual polarization measured on the instrument when it is illuminated by a 100% polarized source. In this case, the 100% polarized source is created by observing a bright non-ploarized star through a wire grid which in introduced in the optical path before the CanariCam entrance window. The following figure shows the wave plate efficiency as a function of wavelength measured with CanariCam spectropolarimetry mode. 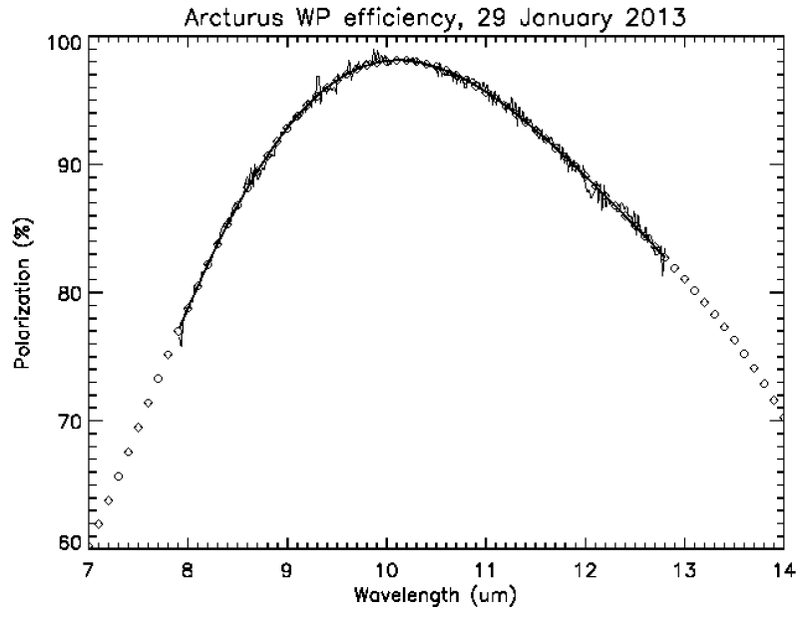 Data correspond to Arcturus and were taken on January 2013. Wave plate efficiency curve measured with CanariCam in spectropolarimetry mode together with a polynomial fit to the data (diamonds). The wave plate efficiency curve is totally consistent with the imaging polarimetry wave plate efficiency results. The efficiency peaks at approximately 10.4 microns, which is the central wavelength of the Si4-10.3 filter. The behavior of the instrumental polarization measured in spectropolarimetry mode is consistent with the imaging polarimetry results, as expected. The CanariCam degree of instrumental polarization seems to be rather flat accross the whole 10-micron window, with values ranging on average between of ~0.5% and 0.7%. Top panel: Instrumental polarization measurement of Sirius with polynomial fit (solid) and wave-plate efficiency profile (dashed). Bottom panel: Instrumental polarization divided by the wave-plate efficiency. We have also checked that the angle of instrumental polarization obtained from spectropolarimetry observations of non-polarized standard stars is flat accross the whole 10-micron spectral window and varies with the pupil angle in the same way as described in the instrumental polarization section for imaging polarimetry. Polarized standards are required to calibrate the degree and angle of polarization of the scientific target. It is recommendable to observe these standards using the same configuration as the in the science target. A good list of mid-IR polarized standards to calibrate spectropolarimetric data can be found in the paper Smith et al (2000), which include degrees of polarization and polarization angles in the wavelength range from 7.5 to 13 micron. Even though the degree of instrumental polarization of CanariCam+GTC and its dependency with the pupil angle is well known and seems to be stable in time, it is strongly recommended to observe a non-polarized standard for each science observation in order to have a measurement of the instrumental polarization as close as possible in time to the science observation. Many of the Cohen standards from the mid-IR standard finder can be used as non-polarized standards, as soon as they are not known to have polarization features. The following table shows a set of suitable stars which can be used as non-polarized sources in spectropolarimetry mode. The BN object in Orion has been considered the archetypal source with purely absorptive polarization from amorphous silicate grains. This object was observed in spectropolarimetry mode with CanariCam in June 2013 in order to be compared with earlier data taken with the UKIRT/UCLS in September 1987 (Smith et al (2000)). The next figure shows that there is extraordinarily good agreement between the overall CanariCam and UCLS polarization profiles, in terms of level, shape, FWHM and peak wavelength. 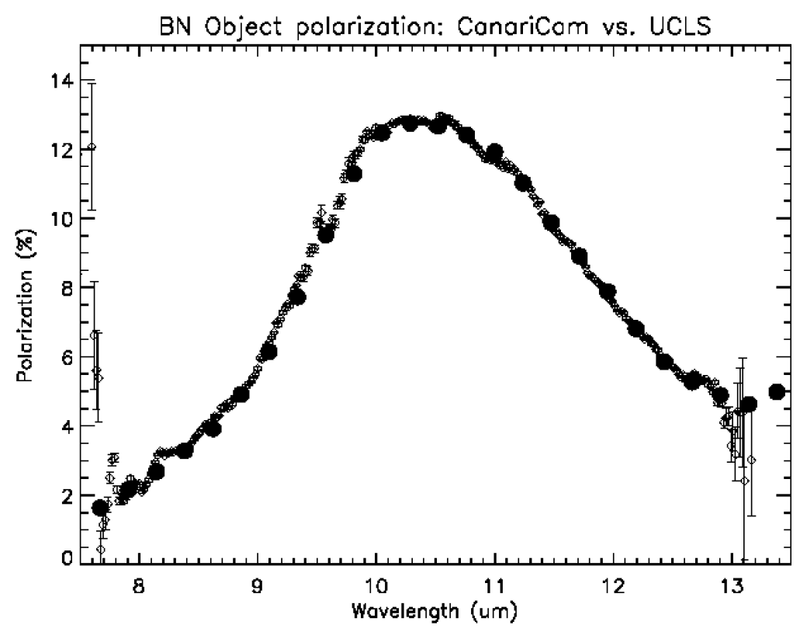 Comparison of the spectropolarimetry of the BN object taken with CanariCam/GTC in June 2012 (small symbols with error bars) and with the UKIRT/UCLS in September 1987 (filled circles). The previous figure shows a polarization emission feature associated with the presence of silicate in this well studied star forming region. The BN object is one of the brightest and stronguest mid-IR polarized sources, with an average flux in the 10 micron band of ~300 Jy and a maximum degree of polarization of ~12%. CanariCam/GTC data have an on-source integration time of 15 min and the typical polrization error achieved was ~0.1%. Data reduction in spectropolarimetry can be performed using the Starlink POLPACK software. Several types of window material, such as KBr, are highly transmissive at mid-infrared wavelengths and strong enough to serve as a pressure bulkhead, but they have moderate drawbacks when used as windows; e.g., they are easy to scratch and/or hygroscopic, or only transmissive over limited wavelength regions. To permit the observer to select the appropriate window for a given combination of scientific requirements and observing conditions, three science entrance windows are installed. 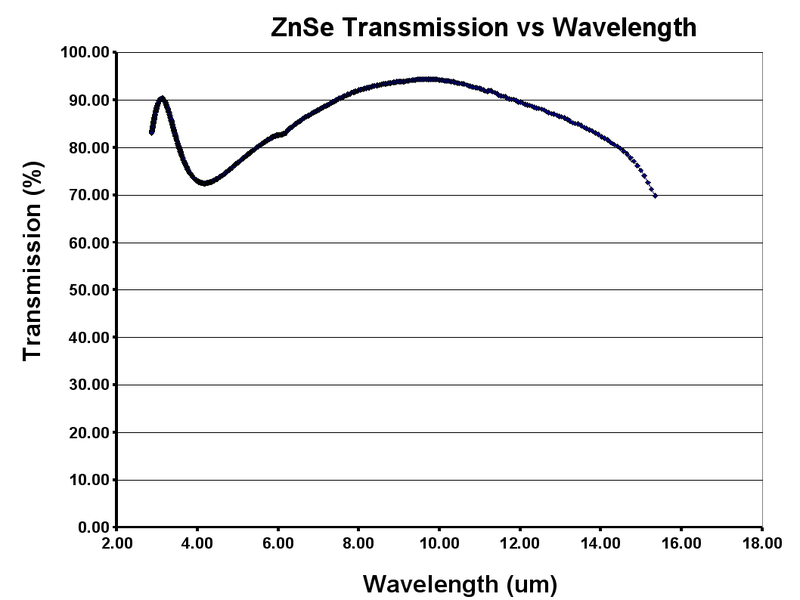 ZnSe, which has exceptionally high transmission at 10 microns, but is opaque at 20 microns. It's the best choice for 10 microns' observations. 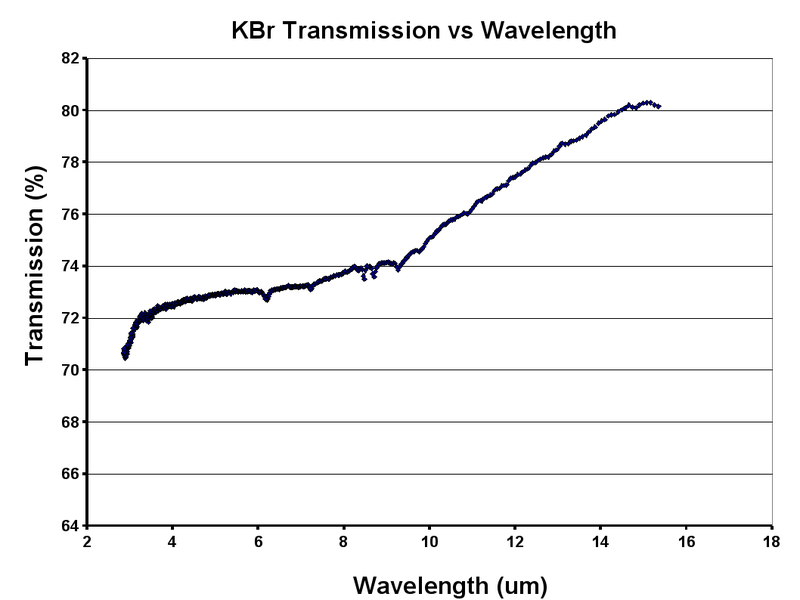 KBr, which has excellent transmission at 10 and 20 microns, but degrades under high humidity conditions. KRS-5, which is insensitive to moisture and transmits at both 10 and 20 microns, though it is less transparent than both the KBr and ZnSe. 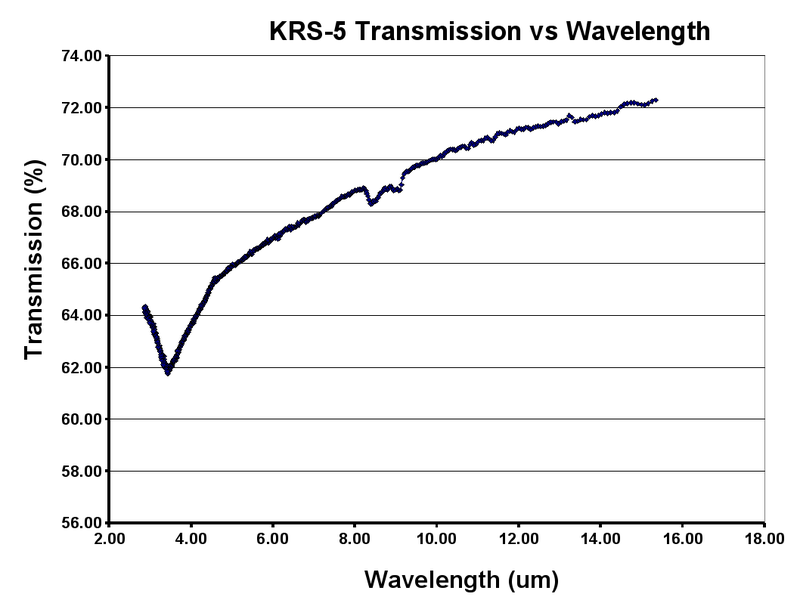 At 10 micron the ZnSe transmission is 94%, and for KRS-5 the throughput is >66% for all wavelengths >6 micron. 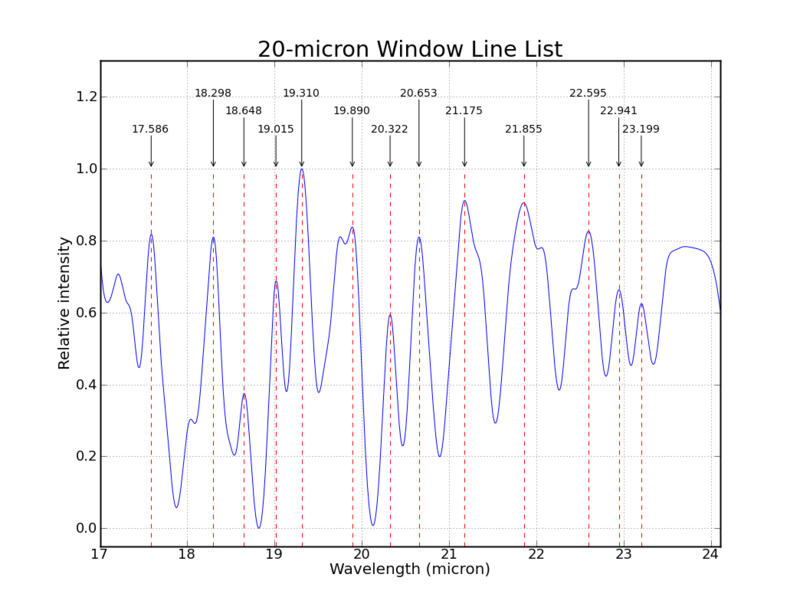 Window tranmissions measured using an infrared FTS spectrograph. KBr and KRS-5 factory transmission curves at 20 microns can be seen in the CanariCam User Manual. In-depth information of the observing strategy is given in the CanariCam User Manual and also in the Gemini mid-IR resources web page. A summary of the main features is given in this page. Mid-IR sources normally are over 4 orders of magnitude fainter than the background emission. Time variations in the noise associated with the detector electronics, and telescope and sky background make imperative the use of a quasi-real time subtraction of the background contribution. The technique used to achieve an accurate background subtraction is the combination of chopping the telescope secondary mirror and nodding the telescope (chop-nod). The chop-nod technique ensures the removal of the radiative offset, a background emission that remains after subtraction of chopping on- and off-source images, due to the fact that the background seen by CanariCam detector is not the same in both orientations of the telescope's secondary mirror. 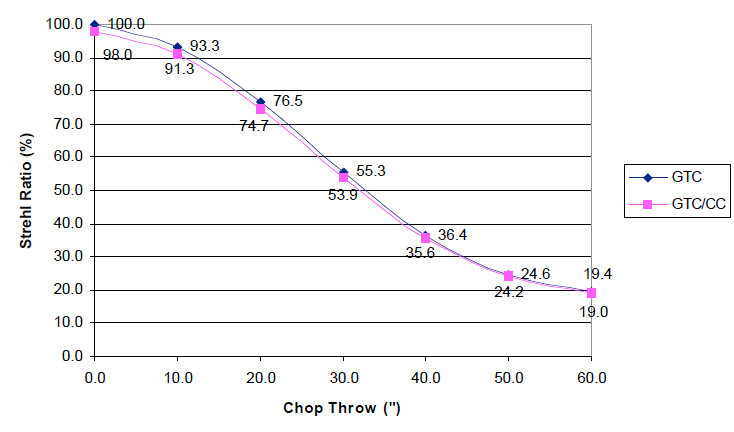 The chopping profile is defined by the chop angle and and chop throw. The chop angle is the orientation of the chop direction on the sky. 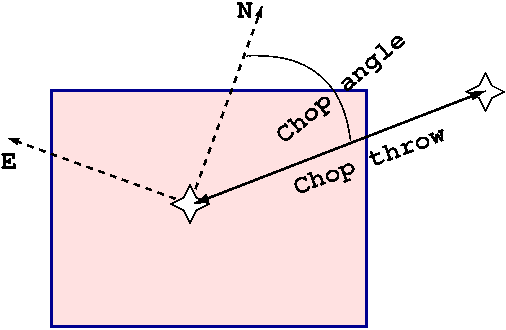 The chop throw is the angular separation between the on-source and off-source positions on the sky. General case for the chop profile. It is possible to chop off the detector or to chop on the detector. In the former case the source will not be present in the off-source image, while in the later case the source will appear in the off-source images. There is not advantage on using one or the other method regarding the final signal-to-noise ration achieved on the target (see details in the CanariCam User Manual. However, chopping on the detector is more recommended for compact targets, because with this technique only 1/4 of the array FOV can be used. Chopping off the detector is normally recommended in the case of extended sources. Figure below shows the case of chopping off the detector. Different background contributions are represented by different background colors in the detector. The radiative offse is represented by a triangular section on the detector. The radiative offset in the second step (second row of detectors) is approximately the same but with oposite sign. By adding up On(A)-Off(A)+On(B)-Off(B) exposures the radiative offset contribution is removed. Case of Chopping off the detector. Figure below shows the case of chopping on the detector with nodding perpendicular to the chopping direction. In the represented case chopping is along the vertical dimension of the detector and nodding along the horizontal one. Only 1/4 of the array FOV can be used. Case of chopping on the detector with nodding perpendicular to the chopping direction. When performing chopping it is important to note that in at least one of the chop positions of M2 the telescope optics are not perfectly aligned, resulting in some optical aberrations. For the GTC/CanariCam system, the image quality was optimized during the design using the guideline that CanariCam should image the beam delivered by the GTC with minimal aberration. However, due to this misalignment when chopping the delivered image quality (at I0) degrades. The level of degradation of the GTC/CanariCam system was characterized using Zemax in terms of Strehl ratio for various chop angles, as illustrated in next figure (calculations correspond to a wavelength of 8 micron). Image Quality vs. Chop Throw for GTC and GTC/CanariCam System. Two representative images are shown in the next figure for a chop throw of 30" for both the GTC and GTC/CanariCam system. Image Quality for a 30” Chop Throw for GTC (left) and GTC/CanariCam System (right). Both previous figures show that CanariCam makes a negligible additional degradation to the chopped image quality. Based on the experience acquired during CanariCam on-sky commissioning, the following overheads should be taken into account during proposal preparation. The dead time while M2 is switching between chop beams. Note: The on-source integration time is the one used in the Integration Time Calculator. Another overhead factor which should be taken into account when preparing CanariCam proposals affects mainly to those observations that will be performed in queue mode for targets that need long on-source times. Our strong recommendation is to restrict observing blocks to a maximum duration of 1 hour (see Preparing for the observations), which includes all the usual overheads. Hence, when estimating the time necessary for your proposal it is important to plan ahead for this recommended 1 hour per OB. It may imply that observations of a single target be split over more than one OB in order to attain the desired SNR. Since each observing block may be observed on different nights, the time required for any calibration must be added to each block. For each individual program, it is very important to consider carefully if splitting the on-source time is actually possible. As each OB may be executed on different nights, in the case of very faint sources the SNR in each of individual OBs may not be sufficient to align and sum the data from the different OBs. Due to the spatial and time variability of the background in the mid-IR and the wide range of observational setups available with CanariCam, all calibrations required for a science program shall be defined by the PI at the Phase-1 and Phase-2 stages and will be charged to the program. Hence, the PI must ensure that adequate calibrations are defined in line with the scientific objectives of the program. Nevertheless, the observatory will normally take a flux standard, in imaging mode, in the Si5 and Q1 filters, once or twice per night, to asses the quality of the mid-IR sky. Such data will be provided. To search for mid-IR standards close to a given Right Ascension and Declination, the mid-IR standard finder can be used. In the following lines, we give some recommendations on the type of calibrations that may be required for each type of program (please refer to Section Overheads for information on the overheads to be taken into account for calibration standards). Bad pixel mask. No bad pixel mask is provided, because only two bad pixels are know to CanariCam detector (see Section Instrument Detector). These should be taken into account during data reduction. Darks and Bias. They are not needed, since these are removed automatically with the chopping and nodding technique. Flat fields. Falt fielding has not been thoroughly explored with CanariCam. However, based on T-ReCS experience at Gemini, flat fields can be more damaging to data quality (increased noise) than an improvement. Hence, flat fields are not taken with CanariCam. Flux standards for imaging. In observations with an elapsed time shorter or equal than 1.5 hours, one flux standard at a similar airmass to the science target should be defined. In observations longer than 1.5 hours, two telluric standards, one at approximately the initial airmass and one at the final airmass of the science observations should be defined. Photometric accuracy is limited to ~10% by the uncertainty in the airmass correction and in the fluxes of the standards themselves. PSF standards for imaging. Normally used to characterise the PSF if deconvolution of the science data is going to be performed during post-processing. In general, the flux standard should provide a approximate measurement of the PSF. However, if dedicated PSF stars are required, the time required to observe them should be taken into account in the time request. Flux standards for spectroscopy. Absolute flux calibration through narrow slits is very unreliable and many stars commonly used as mid-IR telluric standards do not have well-known fluxes. It is recommended to include imaging observations at a similar wavelength if absolute flux calibration is important for the science outcome. Telluric standards for spectroscopy. These are used to remove the telluric lines from the science spectra. In observations with an elapsed time shorter or equal than 1.5 hours, one telluric standard at a similar airmass to the science target should be defined. In observations longer than 1.5 hours, two telluric standards, one at approximately the initial airmass and one at the final airmass of the science observations should be defined. Wavelength calibration for spectroscopy. Wavelength calibration is normally performed by identification of sky lines in the science spectrum. Therefore, extra observations of arc lamps are not required. Unpolarised and polarised standards for imaging polarimetry. Unpolarised standards are used to determine the instrumental polarisation, while polarised standards are used to calibrate the degree and angle of polarisation of the observations. The same rule as for the rest of the standards apply, i.e. one of each should be defined if the science observation is shorter than 1.5 hours and two of each for longer observations. Atmospheric extinction. Atmospheric extinction in the mid-IR is very hard to determine due to the string variability of the background emission. The best way to minimise the uncertainty in the airmass is to observe a flux standard as close as possible to science target. CanariCam data is delivered in standard multi-extension FITS (MEF) file format. Each extension contains the 320x240 pixel image, as well as specific headers relevant to those extensions. The zeroth header is a general header, containing greater information about the full data file. In chop and chop-nod modes, there are 2 chop positions per saveset, and M savesets, meaning that each image is therefore [320,240,2,M]. Almost all science data are taken in chop-nod mode, and each extension contains the savesets for a single nod position. CanariCam can be used in the nod sequences ABAB or ABBA, with the difference being only an insignificant change in overheads. However, it is essential for a minimum number of AB pairs to be observed to permit adequate correction for radiative offset. Frame time. This is the time between readouts of the array and is controlled through the optimized software settings. Typical times are ~25 ms.
Saveset time. This is the time between each co-added dataset that is saved to disc. This is the smallest quantum of data saved by CanariCam. This is controlled through the optimized software settings. Typical times are ~10 s.
Exposure time. This is the user-selected time interval over which the source will be observed. The time can vary greatly depending on source flux, but typically it is in the range ~60-600s. Clock (or total) time. This is the total time need for the observation to be completed, and includes the necessary overheard of chopping and nodding. The multiplicative factor to convert exposure time to clock time is dependant on the observing mode, chop and other parameters used. It is estimated (see Section Overheads) to be 2.7 for imaging, 3.1 for spectroscopy and ~2.7 for imaging polarimetry (telescope and instrument setup excluded). It is important to note that only the exposure time is input by the user (either in the ETC or in the Phase-2 form). All other parameters are set automatically. Note: CanariCam imaging and low resolution spectroscopy data reduction has been tested with IRAF v2.15 and with the Gemini data reduction software v1.11.1, but has not been tested with later versions of both software packages. Detailed information on how to use the software to reduce data for the different CanariCam observing modes can be found in the CanariCam User Manual. Additionally, Omaira González Martín (o.gonzalez at irya.unam.mx) has developed a pipeline (RedCan) for CanariCam imaging and spectroscopy data reduction. RedCan is written in Python, IDL and C-shell, using IDL astronomical libraries and GEMINI/IRAF tasks. The pipeline is described in González-Martín et al. (2013) and the latest version can be downloaded from here. RedCan is specifically designed to reduce AGN spectroscopic data, but it can also be used for other kinds of CanariCam imaging and spectroscopic data. Dan Li (d.li at ufl.edu) has developed an IDL GUI applicaltion (iDealCam) specially designed to process CanariCam imaging and polarimetry raw data files. In particular, iDealCam allows you to do a full polarimetry data reduction, including instrumental polarization correction and the creation of polarization maps. It also has a built-in database of Cohen standards and in-band CanariCam fluxes for flux calibration. The current version of IDealCan does not have the capabilty to reduce CanariCam spectroscopic data, but it can still be used to inspect and stack CanariCam spectroscopic raw files. The software is written in IDL and makes use of the IDL Astronomy Users Library and Frank Varosi's IDL Library. Please, refer to the iDealCam manual for installation and usage instructions. The latest version of iDealCam can be found here. Please, if you use iDealCam to reduce CanariCam data, make reference to Li et al. (2012). All of the software packages described above can be tested with any of the data sets publically availabe in the GTC Data Archive. Important note: O. González Martín and Dan Li have kindly provided access to RedCan and iDealCan, respectively, to the general CanariCam user community. However, the kind of support they can provide is only in a best effort basis. As indicated in the Phase-2 help manual, CanariCam users have the option of relaxing Phase-1 constraints as approved by the Time Allocation Committee (TAC) in terms of requested Full Width Half Maximun (FWHM) of the Point Spread Function (PSF) and Precipitable Water Vapor (PWV). This may be useful when combining N-band and Q-band observations in a single proposal, but which may have very different requirements due to the very different wavelength. 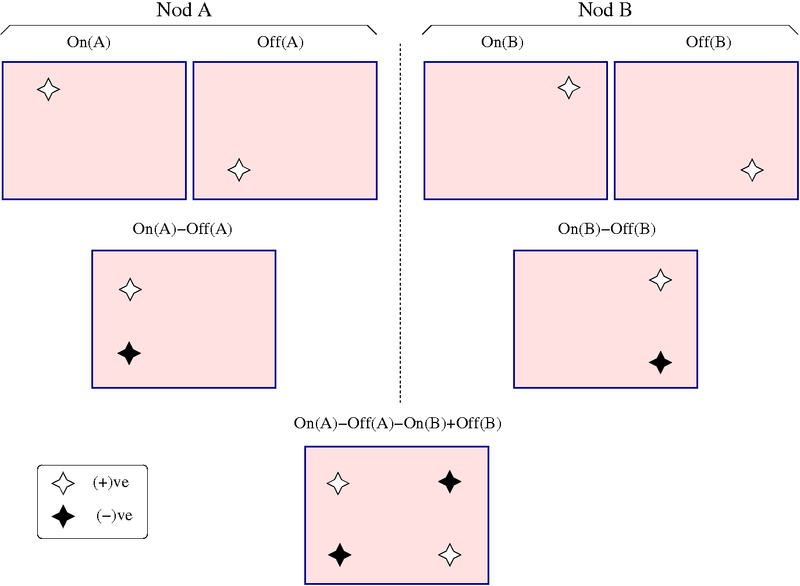 Such relaxation of observing conditions can be done independently for each Observing Block (OB) of the same proposal. This provides enough flexibility to relax, for instance, the PWV conditions for observations in the 10 micron window, which is not as sensitive to the atmospheric water vapor content as the 20 micron window. Similarly, some users may want to relax the requirement on the FWHM of the PSF in the 20 micron window, where the diffraction limit is less restrictive than in the 10 micron window. 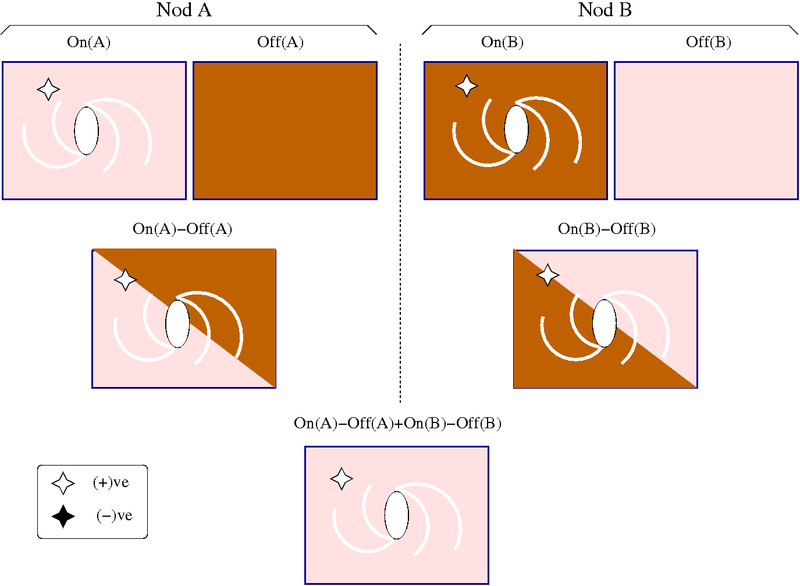 Since OBs are treated as indivisible atoms within an observing program, only one set of observing constraints can be defined for the whole of the OB, even if the OB contains different types of observations. If, for any reason, it is not possible to use the same observing constraints for 10 and 20 micron observations, then separated OBs should be defined for each wavelength range. Gemini Observatory staff has made an excellent work by providing observers with thorough information and useful tools to prepare their mid-IR observations. We encourage prospective CanariCam observers to consult the Mid-IR resources page at the Gemini Observatory web site. Additionally we provide a mid-IR standard star finder, which can be used during proposal preparation to search for standard stars close to your favourite science target and to have a rough estimate of their fluxes in the CanariCam filters. This web page and the CanariCam User Manual makes extensive use of the detailed information provided by the Gemini mid-IR team. We are deeply grateful to the Gemini Observatory staff for sharing with us their work and for allowing us to publish part of their mid-IR resources in our web site. The key people associated with those activities are Drs. Rachel Mason, Kevin Volk, and Scott Fisher. We also use sections of the Starlink POLPACK software, written and documented by Berry & Gledhill. Much of the IRAF script work for the software was written by, or under the direction of, Kathleen Labrie, also at Gemini. We have made use of the atmospheric transmission models generated using the ATRAN modelling software (Lord, S.D. 1992, NASA Technical Memor. 103957) and published in the Gemini Observatory web site.